But, now, Old Guardian is fairly easy to find as most all Whole Foods have it at all times. So, now my rare drinking of the beer is done on purpose for, you see, I don’t want to ever not love this one. And, with my ever-present goal of trying as many different beers as possible, I often neglect to drink the ones that I’ve always loved, intentionally, and dumbly, avoiding them on the shelves. I probably hadn’t had an Old Guardian in a half-year or so when I saw it on the shelf and realized, It’s time again. A part of me is worried every single time that I retry an all-time favorite that it just won’t be the same. I simply won’t enjoy it as much. I’ll have somehow grown in my beer-drinking ways since my last sampling and realize a certain beer just ain’t what I used to think it was. I mean, my favorite movie used to be “Flight of the Navigator.” And then I turned 8. Therefore, I was a bit leery as I opened a gorgeous bottle of Old Guardian. Wow, my fears were quickly assuaged and I was taken to heaven. This beer is so potent and so tasty. It’s almost not like beer, more akin to a Sam Adam’s high ABV Utopia, though clearly not as intense. The orange and banana alcoholic taste shocks your tongue. You don’t take big gulps, just tiny little sips, savoring every single whiff and drink of this beauty. The flavor staying with you well after you put your beer back down. I like to stick my face completely into the glass as far as it will go and inhale this beer deeply for a good minute or so like I’m some sixteen-year-old redneck that stole a nitrous tank. I wanted to time how long it would take to drink, to savor, an entire bomber of Old Guardian. I started the stopwatch at 9:18 PM and with the final sip I clicked it off. It was 11:15. A two-hour beer! In fact, a two hour high. It’s like floating on a cloud, not like getting wasted or fucked up as a bad macrobrew makes you feel. In fact, I didn’t even realize I was drunk until my friend came home and I started rambling on and on about how sorry I was that his favorite NBA team, the Spurs, had just lost their playoff series to the Lakers. Only then did I realize how wasted I was. Someone must have roofied my Old Guardian. Then again, funny thing, I was by myself all night. And, I haven’t roofied myself since freshman year. Nope, the beer had done it’s work. And I went to bed happy. I love you Old Guardian, see you again in October or so. 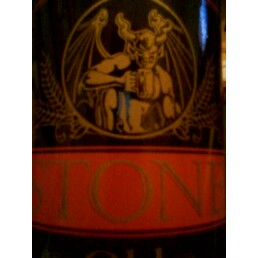 This entry was posted on Wednesday, June 4th, 2008 at 8:07 pm and is filed under Brewer: Stone, Country: America, Grade: A plus, Style: Barley wine. You can follow any responses to this entry through the RSS 2.0 feed. You can leave a response, or trackback from your own site. I had my first Stone Old Guardian Barley Wine this weekend based on your glowing review. I was expecting to not like it based on my sophisticated palate that prefers the likes of Miller Lite and Bud Light but actually really enjoyed it. Good call on this one. I might rank it above Miller Lite, that’s how much I enjoyed it. Wow. I’m impressed. It’s a potent beer but an unbelievable one.